Welcome to our interactive SC BBQ Trail Locator Map, the easiest way to find all the SC BBQ restaurants near you, wherever you are. Looking for a restaurant on the South Carolina BBQ Trail? Wondering where all SC BBQ restaurants are near you, wherever you happen to be? 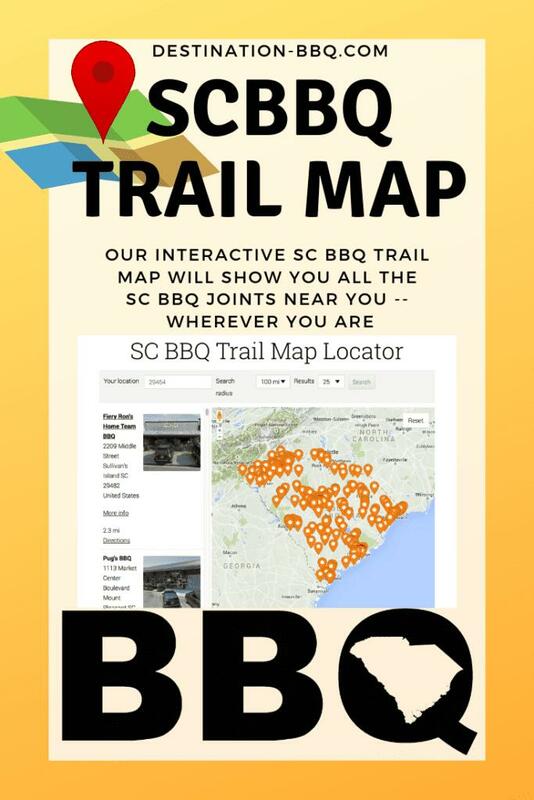 Do you like the official SC BBQ Trail Map but wish it was clickable so you could easily find the barbecue restaurant you are looking for? This is the map for you. When the map loads, the map will ask your permission to find your current location. If granted, the map will show you the closest 25 SCBBQ restaurants within a 100-mile radius. Your location will also be represented by a green marker on the map. If it cannot determine your location or if you choose to not allow the map to find your location, then you can enter your location into the search field and press “Search.” The map will then zoom in on your general location and show the restaurants in your search area. By default, the map will show you the closest 25 restaurants in a 100-mile radius; however, you can change the search criteria to suit your needs. Each restaurant will also be listed near the map, sorted by distance and will include an image of the restaurant itself. In addition, if you click More Info on any listing or click on any marker, you will be provided additional information about each restaurant including address, phone number, hours, and access to directions from your current location and street view. We encourage comments on the map and its functionality in the comment section at the bottom of the page. 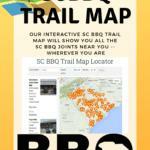 We will do all we can to make this the best map for your SC BBQ Trail searches. In addition, you can filter your results using the category filter on the search form. Driving through Inman and have a hankering for some mustard-based BBQ? Now you can find all the restaurants in your area that serve a mustard sauce. Passing through Hartsville and out of cash? Now you can find all the restaurants that accept cards. Really want to know where the best of the best SC BBQ is? Now you can find all the SC BBQ restaurants in your area that the SC BBQ Association has designated 100-Mile BBQ, barbecue so good it’s worth driving 100 miles for. Wouldn’t it be easier to jump right to this map when you need it? Simply save this page as an app icon on your mobile device. Then, you’re just one touch away from all the SC BBQ in your area. And it is easy to do! That’s it. Now you should have an icon on your device ready to use whenever you need it, without having to remember the address. Here are more specific instructions for Apple, Android, and Windows devices. South Carolina barbeque has a long and special history. Our BBQ is both varied and abundant. In fact, anyone contemplating a road trip through the state could benefit from a guide to help them find all the offerings on the SC BBQ Trail within 10 miles of one of our interestate exits. To help our famished travelers, we published a series we call SC BBQ Road Trip. These articles serve as an SC BBQ Restaurant Field Guide that documents all the SC BBQ easily accessible from each of the interstates that intersect our state. If you love SC BBQ as we do, you will appreciate this guide. Curious? Ready to hit the road? Love SCBBQ? 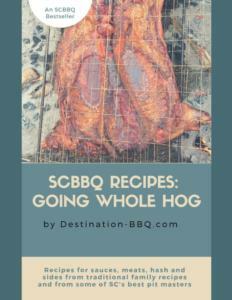 Check out the first edition of our cookbook: SCBBQ Recipes: Going Whole Hog. Learn more about in this article where we first announced it. Packed with over 150 pages of recipes and stories from old family recipes to today’s top SCBBQ pitmasters. Thanks for the heads up, Mike. Sorry to hear that. They had a rough start with a fire and had to rebuild. Must have been too much. I will remove them from the map. Thanks again. Hey Mike! We definitely want to get you listed. I actually thought we had reached out to you recently about just that, but darned if I can find it. I will message you on your Facebook page. Thanks! We own and operate KC Mike’s Smokin’ (we’d fit right in for that ‘dry rub’ filter!) here in Beaufort, SC. I would love it if you’d add us to the BBQ trail map! Our restaurant address is 81 Sea Island Pkwy, Beaufort SC 29907 843-379-BEST (2378) Soon our website will be updated with the restaurant info and a menu, but our FB page has that already. Come see us! Dang. Thanks for the heads up. Fixed it and owe you a rib. Welcome to the site….and let me know if you find anything else! This is my first visit to this site. Immediately noticed a typo in the Filter, where Restaurants is spelled “Restuarants” on the online Trail Locator Map page. Do I get a free rib? Guiyion, we added KBBQ to our map and published your store listing on 4/1/18. Here is a link to your listing: https://destination-bbq.com/stores/kbbq/ And if you are using the map, as long as you are near the restaurant, it should pop up automatically if you give the map permission to find your location. If not, just search for your zip code and you should find it there. When I type in Spartanburg, SC and click the Find SCBBQ button, I get KBBQ as the fifth closest listing in my results. You reached out to us here at KBBQ a few months back and we have periodically checked your website to see if we were listed. Unfortunately, it does not list us each time we check. Hey Sean, Thanks for writing and letting us know. As I have said many times, unfortunately folks aren’t required to get our permission to open or close a BBQ restaurant in SC, so we have to learn about new places through research and word of mouth. Happy to add you. Thanks again. How do we get added to the trail? Not quite yet. When we are able to select more than one filter at a time, maybe, but for now I felt like I needed to keep the list of filters at a manageable number. As a result, I chose to leave a number of criterion out. Stay tuned and thanks for asking! Not yet. When we are able to select more than one filter at a time, maybe, but for now I felt like I needed to keep the list of filters at a manageable number. As a result, I chose to leave a number of criterion out. Stay tuned and thanks for asking! No filter for dry rub?!? Thanks, GM. We used to travel right by there for years when traveling from Georgetown to see family in Camden. Never knew it was there. I am adding it to the map now.